Below are Box Office Collection Report of bollywood film 'October' With his review, budget and total box office and worldwide collection status. October movie lead star cast is Varun Dhawan, Banita Sandhu. 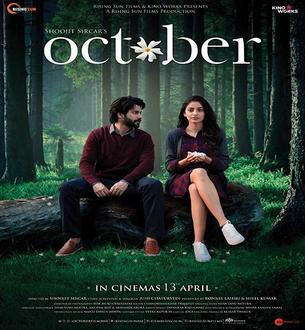 October is an indian Drama, Romantic Film of 2018, directed by Shoojit Sircar and produced by Ronnie Lahiri, Sheel Kumar. October film Released in over 1683 screens in India and 625 screens in overseas, Total 2308 screens worldwide. At the level of acting, Varun Dhawan, Banita Sandhu, Gitanjali Rao all have done a great job. The innocence and mischief of Varun's character is impaired. Who tried hand in all kinds of films, Varun is impressed in this movie. On the other hand, Banita Sandhu who did not get much dialog in the film, But wins the heart with her expression.